"Growing Up Is Hard to Do is an excellent guide to the first two decades of life. It offers both factual material and gentle guidance in text augmented by UK cartoonist Ian Baker’s superbly appropriate illustrations. This is a book that adolescents would find helpful and reassuring during the turbulence of growing up, and hopefully, one which parents and teachers would endorse." 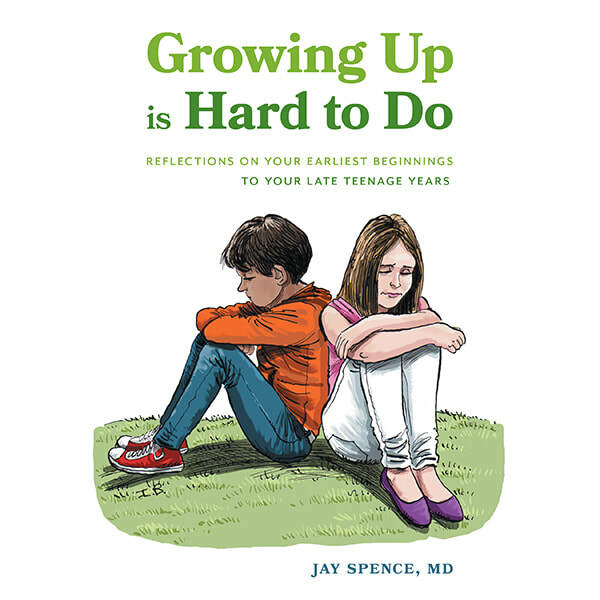 "A brisk, useful, and extremely accessible handbook about growing up... an invaluably clear and straightforward collection of answers to the most basic questions [Dr. Spence's] young readers will have about the stages of their lives." "Growing Up Is Hard to Do is not for the faint of heart, however this wonderfully written book, by a highly experienced adolescent gynecologist, will be very helpful, not only for the young reader, but for their parents and teachers alike. There is a refreshing frankness to the prose, which is softened by the author's obvious understanding and empathy for the young person on a path to adulthood - all in all, most helpful and informative." "Dr. Jay Spence is the wise uncle we always wished we had. In his engaging book “Growing Up is Hard to Do”, he sits us on the sofa, tosses another log on the fire, brings us a mug of hot chocolate and tells us the story of life. In a friendly yet direct tone, Jay invites us to join him on a journey which we’ve all travelled but on which we have seldom paused to take in the scenery. Beginning with the joyful union of sperm and egg (“Hello there” exclaims the egg to a swarm of eager squigglies in the first of Ian Baker’s many charming illustrations) and taking us through all the stages – physical and emotional - from conception to young adulthood, our avuncular guide gives us the facts of life in a compelling manner. No punches are pulled and no taboo subjects are avoided. I think children, young people, parents and teachers alike will thank the author for providing a forum for discussion about a subject that is so essential that we try and avoid ever talking about it!" This work, by an acknowledged expert, addresses the development of girls and boys in the different phases of their lives. In perfect clarity, with not a hint of condescension, Dr. Spence faces all aspects of the maturing process head on, including such difficult questions as sexuality, alternate sexual behaviour, drug use, and eating disorders, and gives sound explanation and advice. "Growing Up Is Hard to Do is an honest, direct but gentle read that all young people should have access to. It belongs in every home that has young teenagers."